I arrived at the Asian University for Women (AUW) with little experience of being on the other side of the desk of being the professor, rather than the student. My first day felt like the first day of school. I had a bag full of new pens, plastic folders, a small banana, and a laptop that still had to be connected to the network. I remember I was worried about some pretty banal things, like, how to deal with Venetian blinds, being the most ridiculous. I tried, and probably failed, to look a bit older. After all, I would be teaching second and third year students. They were going to be around my age. This last thing soon stopped being an issue. 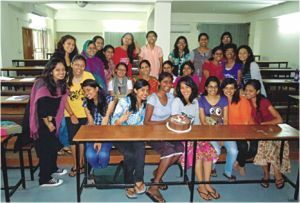 AUW is a young place, and it thrives on its sense of youth and joie de vivre. As the permanent campus is still being built, the students live and work at a couple of buildings in the city centre. Everything happens here, in not very much space, and you can feel all the effects of compressed energy. The buildings are connected by a series of walkways, which feel more like the gangplanks of a ship than anything else. As my students and I discussed why April is or is not the cruelest month, I was struck by the way that ribbons of verse and sentiment can resonate, regardless of context: some things just work, no matter the time or the place or the audience. But perhaps this says less about the texts, than it says about the students. AUW students are willing to relate to these distant pieces of literature. They are smart and engaged enough to extrapolate some kind of wider relevance. When they read an extract from Dickens, they realise there is something apt about it: first, they appreciate the significance of a man trying to describe life in a teeming city, the fascination of which lies in its details. More importantly, they read Dickens as a voice of outrage against injustice, precisely the kind of voice that the region needs today. I wanted to push this idea during my class on Dickens, and it is something that the students instinctively got. AUW students, then, look for a stamp of universality when they read texts, because they believe in clear human truths that there are things which unite us all. But at the same time, they are powerfully aware of their responsibilities as individuals and of the particular needs of their communities. I was helping the third year undergraduate students with their applications to graduate school, and was amazed by the specificity of their vision. There are students who want to work on water policy in Nepal, on maternal health in Bangladesh, on urban planning, poverty reduction, and Asian politics. And this brings me back to youth. Another of my writing classes was on what it means to be young, and to be young women in Asia. We began by listening to six or seven songs that were lying around on my iTunes. They were songs I had identified as relevant: some had been written by young people, others were directly about youth, and a few had united young people in generations past. We agreed that 'Bicycle Race', by Queen, is a great song (who could resist its playful renunciation of all duties and its clever engagement with pop culture?). However, our longest discussion was about Lennon's 'Imagine'. Fourteen young women, sitting in a little conference room in downtown Chittagong and listening to music through tiny speakers, realised one thing, that it is their prerogative to imagine.